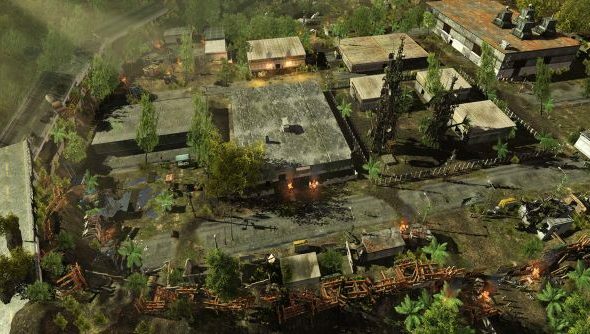 The second post-release patch for InXile’s Black Islish opus, Wasteland 2, went live on Steam yesterday afternoon. It’ll appear shortly on GOG, Origin and something called Glyph, if it hasn’t already. Like one of those non-canon blimps they had floating about Fallout Tactics, the patch is a biggie. It begins with improved performance for lower-spec systems, takes in a bunch of fixes to California’s questlines, and winds up in a pile of extra hints and tips to be shown during loading screens. InXile have made a “large amount” of memory optimisations, especially in audio, that should improve speeds on 32-bit PCs, laptops and the like. On the subject of speed, there’s also now a travel-quickening toggle on the world map, designed to let you “zip and zoom around if you so please”. It won’t affect encounters, of course – you’ll still have to fight those in less-than-real-time. But encounters, too, should be shortened somewhat by a plug to the ‘unlimited AP’ bug, that sometimes allowed enemies to move much farther than intended. Hollywood and Griffith Park have enjoyed the lion’s share of questline fixes, but the studio say there are improvements dotted throughout California. You may need to load a save from before Hollywood to see them all. Elsewhere there are UI updates, including support for “very large” text, and 50 new loading screen messages. Although you won’t have to see those if you don’t want to – loading now continues when the game is tabbed out, and pauses after finishing. There’s more – so much more. Absorb it all on the official Wasteland tumblr, like rays from an unrelenting post-apocalyptic sun. Hey – did you ever listen to General Vargas’ Wasteland 2 survival tips?